This paper describes an experiment carried out by two English teachers at Tampere University of Applied Sciences (TAMK), Finland. The preparation and implementation of the experiment are discussed focusing on the challenges and outcomes. In the experiment, a fairly international student group and a more homogenous group consisting mainly of Finnish students collaborated on a small joint cross-disciplinary project. The project challenged them to utilise the skills they had already accumulated in the course of their studies and to use English in an authentic context. The teachers took advantage of a real-time student response system and implemented a very student-centered pedagogical approach. Even though Finland has been renowned as one of the leading countries in the world as regards the field of education, one of the common points of criticism from higher education students is that they do not get to meet students outside of their own degree programme much, let alone non-Finnish students. This was one of the reasons why the authors decided to do an experiment with two groups of students. The authors teach English at Tampere University of Applied Sciences (TAMK) in the Degree Programmes in Media and Film and Television. The second reason for the experiment was to promote internationalisation at home by bringing together a group of Media students where more than half of the students were non-Finnish, and a group of Film and Television students consisting mostly of Finnish students. The third reason was to create a meaningful and authentic setting for the students to adapt the skills they had already learned in the course of their studies. The teachers decided to conduct the experiment as part of their English courses. They had a couple of face-to-face meetings, where they brought together their ideas and outlined the framework for the project. In addition, they collaborated online utilising tools such as Google Drive. In planning the experiment, the greatest challenge appeared to be the schedule. Even though the idea was only to use half a day for the project, it was fairly difficult to bend the fairly rigid schedules to meet the needs of the experiment. However, the teachers managed to find a joint time slot when both of the groups and a suitable facility were all available. Since the groups selected for the experiment were studying fairly similar fields in the Degree Programmes in Media and Film and Television, there were plenty of possibilities regarding the choice of the topic for the project. One of the objectives for the experiment was to give the students a possibility to practice the skills they had already learned in an authentic situation, and therefore pitching and project planning were included as central elements. It was decided that the students would be divided into cross-disciplinary teams of 2-3 students and given the following task: to plan a 1.5-minute marketing video for TAMK aimed especially at the international students. They would have to write a small project plan, a preliminary draft or treatment of the video, and to be prepared to give a 2-minute pitch about their video to “the Management Group of TAMK” (the rest of the students). Each team would also give feedback on the pitch of another team. The teachers had reserved a large, open facility for the project that has about a hundred seats with a stage and separate places designed for group work. First, the students were explained the scope of the project and the schedule for the day (half an hour for instructing and grouping, an hour for planning the video and the pitch, and an hour and a half for pitching and giving feedback). Next, they were divided into cross-disciplinary teams consisting of 2-3 students. The idea was that there should be students from both degree programmes and also Finnish and non-Finnish students in each team. The grouping was done so that students were given a piece of paper with an exotic animal in it (for example aardvark, manatee or capybara). Since there were 16 Film and Television students and 28 Media students, 16 animals were used. Then they were asked to find the students who had the same animal as they did. This resulted in a situation where each group consisted of one Film and Television student and one or two Media students. After the grouping stage, the students went on to find a suitable space to start planning the marketing video and the pitch. They were provided with an empty project plan form that they could utilise. The students had already studied the plan in class prior to the experiment. At this point, the teachers circulated among the student teams providing assistance and guidance if needed. As time went on, the most important task for the teachers was to remind the students about the time available for planning. When the student teams had finished their work, everybody returned to the main room. First, each student team handed in their project plan for the marketing video. Then they started to pitch their ideas to the other students (see picture 1). While the students pitched, the teachers made sure that the pitches did not exceed the predetermined time limit of 2 minutes. They also wrote down the working title of the marketing video and wrote it down in connection with the group animal (for example “Team aardvark: The TAMK Machine” or “Team manatee: TAMK Is So Good Even Aliens Like to Study Here”). In addition, the teachers gave written feedback about every pitch. Each student team also received peer feedback from another student team. Some of the students used PowerPoint or other similar slide software in their pitches, but this was not a requirement. PICTURE 1. Students pitching their marketing video. Photo by Joanne NH Wong. After all the pitches were heard, the teachers used a real-time student response system called Socrative to set up a poll for the best pitch. Because the teachers had entered both the team names (exotic animals) and the working titles of the pitches into Socrative, it was easier for the students to remember the pitches. Socrative is free and easy to use, and it can be used on all devices, which meant that students were able to use their smartphones, tablets or laptops to vote for the best pitch. While the students were voting, the result was constantly updated in real time on the data projector. After the vote was finished, the winning team was given the prize, which was a couple of bags of candy. All in all, the experiment was a really positive experience from the point of view of the students and teachers alike. The students enjoyed the fact that they could meet other students from another degree programme. 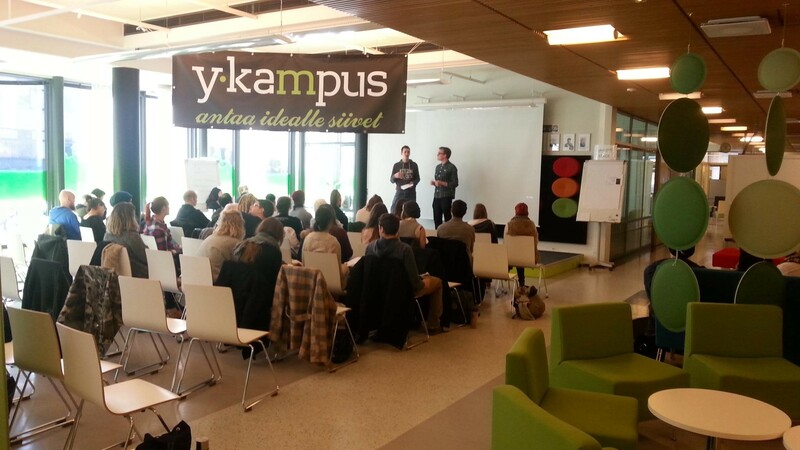 In addition, the Finnish students enjoyed getting to know the non-Finnish students and vice versa. They also liked that the task given to them was authentic and realistic and that they could utilise their developing professional skills in it. Even though the prizes were not of high monetary value, the winning team seemed to enjoy getting them. The respect the teams gave to each others’ pitches was also very great and seemed to work as a motivation factor: all teams presented well-thought-out pitches and all of the teams faced the challenge seriously. The teachers felt that the experiment was fairly easy to carry out (scheduling being the greatest challenge), and it brought about several positive outcomes. A somewhat interesting and perhaps unexpected advantage came from the use of the exotic animal names. As most of the students had no idea what the various animals actually were, finding out what their group’s animal looked like with the help of Google Image Search turned out to be a good and quick icebreaker task. Previously unfamiliar students found a common ground in this very small and non-formal information searching task. In comparison with using just, for example, numbers or letters as group identifiers, this seemingly unimportant and superficial choice provided an unexpected but good additional result. A year later, the experiment was replicated with the students from the Degree Programmes in Media and Business Information Systems, and it was considered equally successful.